Steve Zarelli presents: The Collecting Obsession: Your Charlton Heston autograph? It's probably fake. 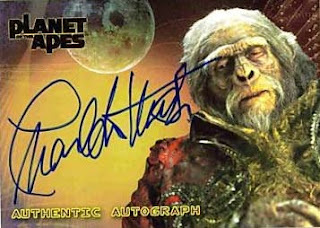 Your Charlton Heston autograph? It's probably fake. As much as it pains me to write this, it needs to be done. 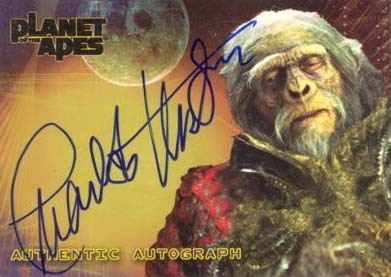 The Charlton Heston autograph in your collection was probably signed by a secretary. I know the first step is denial... I've been through it myself. But let's put aside wishful thinking and look at the evidence. 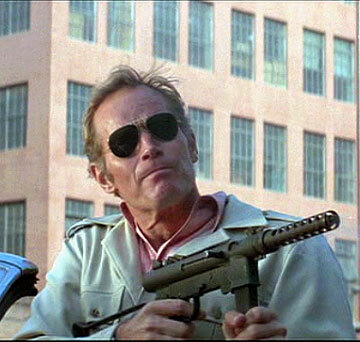 For several years some collectors have speculated that Charlton Heston used a secretary for through-the-mail requests. This has been met with some doubt. 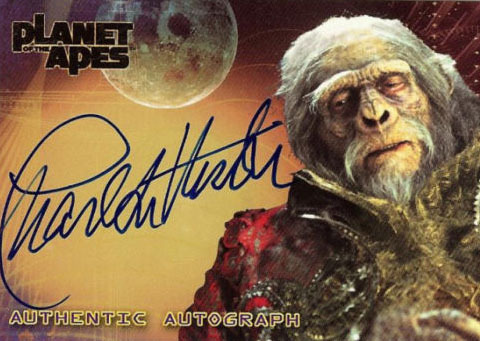 The analysis I saw was less than convincing because it primarily compared old signatures to new, and it focused on differences in "Heston," which were very difficult to clearly discern. The doubt was also fueled by Mr. Heston himself who claimed on several occasions to personally respond to mail requests. But, these suspicious collectors were on to something. And, I believe I have found the definitive "tell." It is in the first name. And once you see it, it is as clear as a bell. 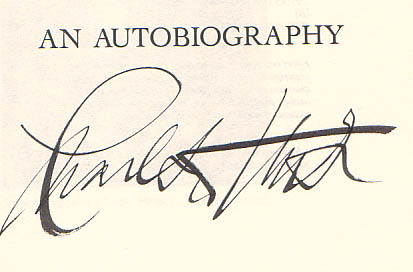 Photographs and other memorabilia sent to Mr. Heston's office were signed by a secretary. 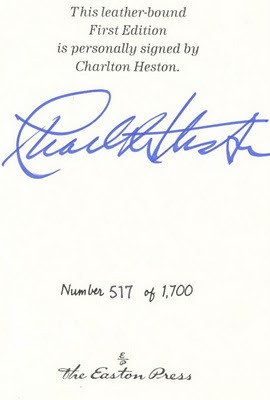 However, Mr. Heston did authentically sign books through-the-mail. 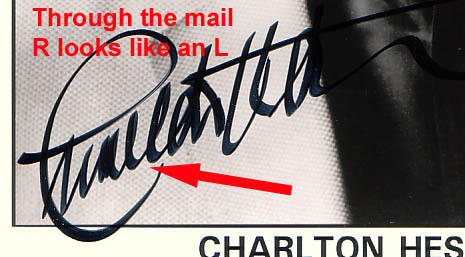 In authentic signatures, the R in "Charlton" is distinctly a lowercase "r" and less than half the height of the L. The first four letters are clearly "Char." 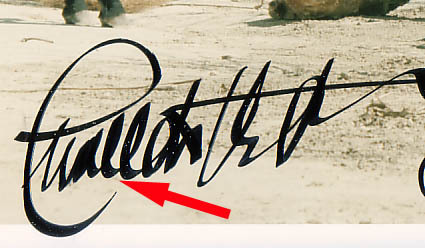 In secretarial signatures, the R looks much more like a lowercase "l" and is about the same height as the L. So, the first four letters appear to be "Chall." We'll start with books that were signed in-person. 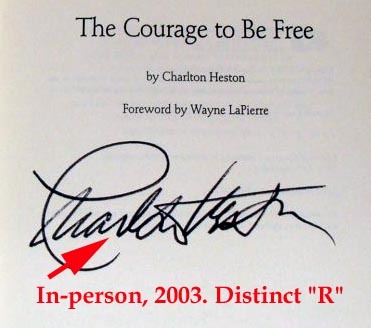 Note the distinct lowercase "r" and the R is much smaller in height than the L.
Mr. Heston at a book signing. Note the distinct R.
Next, here are signed Planet of the Apes trading cards (2001) from a supervised signing with Topps. Once again, the R is clear and no more than half the height of the L.
The following example shows the stark contrast between secretarial and authentic. 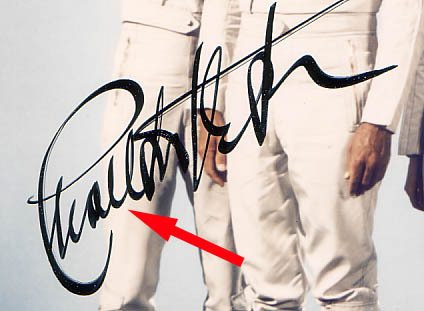 Presented like this, it's pretty clear that the same hand did not sign these two signatures. 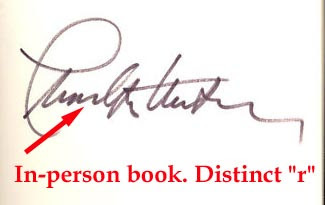 The evidence shows that in every case where there was a known authentic exemplar, the R is distinct and much smaller than the L.
Here are some books that were obtained through-the-mail directly from Mr. Heston's office. 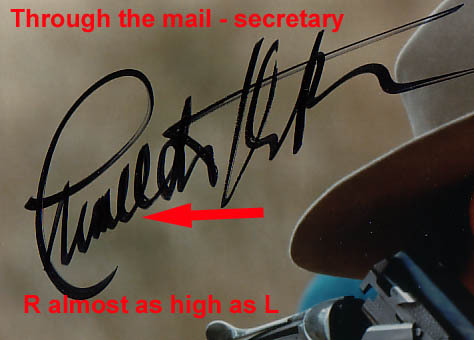 The through-the-mail books also show a distinct R.
Here are examples of signed photographs obtained through-the-mail. Note the clear difference in the R formation and the R is almost as high as the L.
I could go on and list thousands of examples with the "Chall" formation. 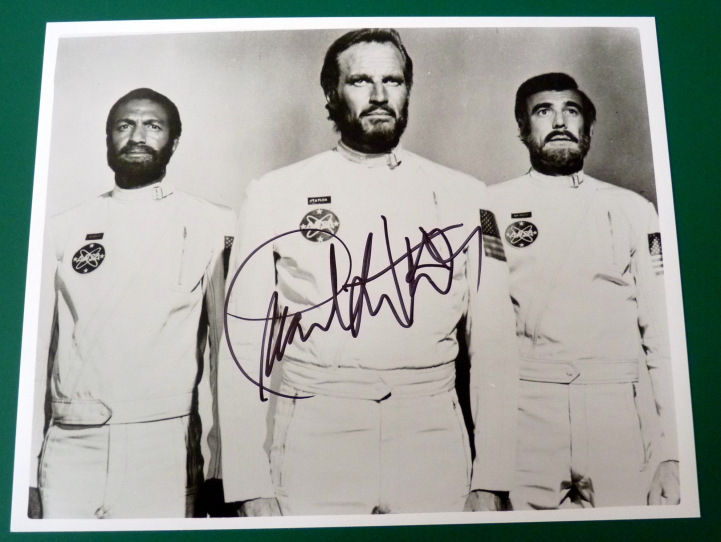 Just look at the signed photos on eBay or do a Google image search. About 95% of the photos have the earmarks of a secretarial signature. The books are almost always consistent with my theory as well. 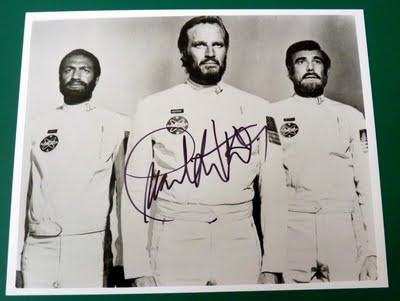 Here is one signed photo I found that I believe to be authentic. Note the stark difference in the signature as opposed to the secretarial examples above. 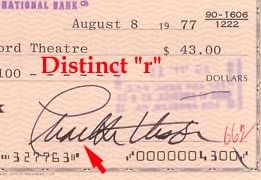 In addition to the distinct "r," the signature exhibits much less pressure. Authentically signed photo? Note the contrast to the secretarial signatures above. I reviewed hundreds of Charlton Heston autographs from various sources -- my personal collection, friends' collections and on online sites such as eBay. I will note that, out a hundreds of exemplars, I found a handful of books that did not have a distinct "r" formation. My theory is these books may have been through-the-mail exemplars signed by a secretary. The reason for this could be that Mr. Heston's schedule did not allow for signing at that time or, once his illness took hold, secretaries began signing books through the mail as well as photos. I understand there will be resistance to these findings. 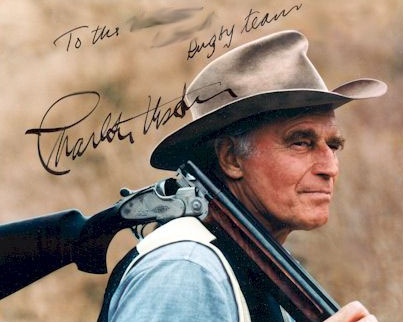 There are thousands of signed Charlton Heston photos sitting in dealer inventories and probably tens of thousands more in collections -- the overwhelming majority of which are fakes. Some of these have been authenticated by reputable third party authenticators. 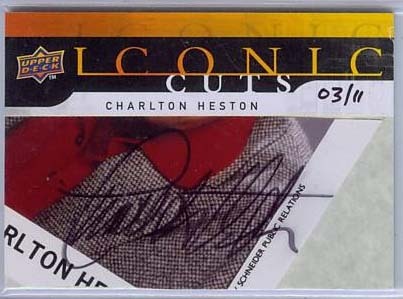 Don't trust third party authenticators with Heston -- they all got it wrong! Upper Deck card - appears to be secretarial. Until someone can produce proof otherwise, we must conclude we were all wrong. For years Mr. Heston stated that he signed mail requests. Well, he was telling a half-truth. 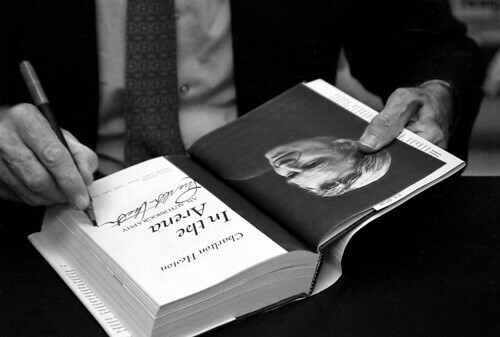 He was signing books sent to him, but his secretary was signing the photos and everything else. Note all images are copyright their respective copyright owners. His secretarial/office staff at Agamemon Studio, which was owned by him and his son, also used a rubber stamp of his signature, especially on autographed head shots, more frequently used as he got older and his handwriting became shaky. This was definitely necessary for the amount of autographs that was requested just on a daily basis, especially in his last years. Also, his accountants had rubber stamps, or pre-inked press stamps with his signature for the signing of checks which is legal form of endorsing checks. Thank you. Until I found 2 Charlton Heston autographs, or should I say "Challton Heston", that were both verified by PSA/DNA and the cert numbers match the cert verification on their site. Here they are by the way, check for yourself.. I believe those both to be secretarial. The photo is one of the standard photos Heston would send with mail requests. As I wrote, I believe all the third party authenticators got this one wrong. JSA (Jimmy Spence) has since come forward and stated he believes these findings to be true and has updated his files accordingly. Autograph World, R&R Auctions and Al Wittnebert have all stated they believe these findings have merit. PSA/DNA was nortified of this study over a week ago and has not yet commented. Yes, it will ding them a bit, but nobody is perfect and stuff like this should be expected once in a while. In hindsight, weren't we all a bit naive to think Heston was signing mass amounts of photos through the mail on a daily basis? I have an envelope, signed letter, and signed picture from 1976. It's very hard to tell. I would like to scan them later tonight and post a link to the pics... perhaps someone could give me their learned opinion. 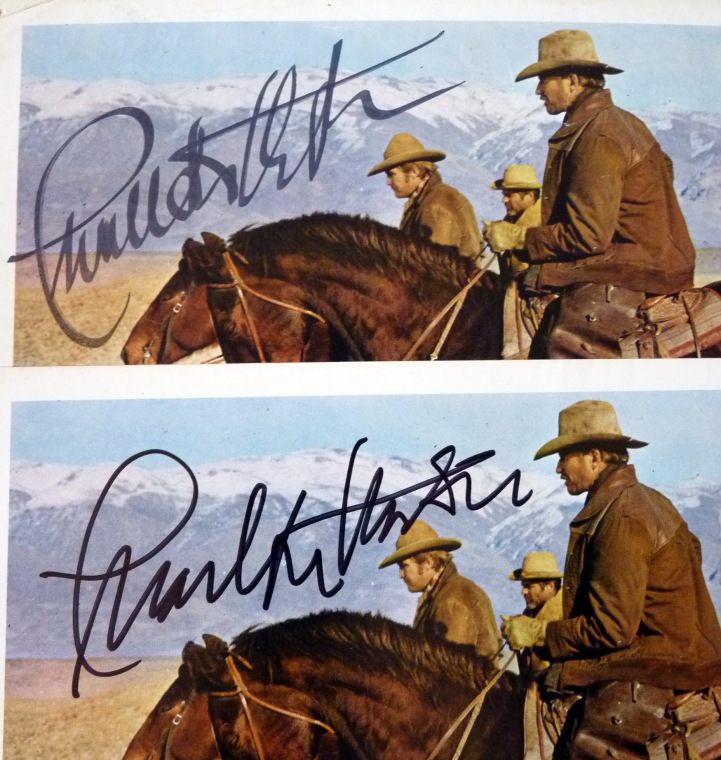 It does not look like the secretary signature but there are no authentic 1970's sigs here to compare it to. Peg - I beleive both of those examples are most likely authentic. Thanks for reading! I believe that the secretarial signings occurred as far as the late 1970's- if anyone interested I can post a scan of an signed photo obtained via mail c. 1979 that appears to be secretarial. Sure, please post a link to the scan. If this is a problem, let me know and I'll provide you with my email address. Thanks! ok Steve let me try this one more time- if this link does not work let me know, if you have an email address that would be great in any event as I have more on this to send. This was obtained in the mail in late 1979, photo was sent to his home address. 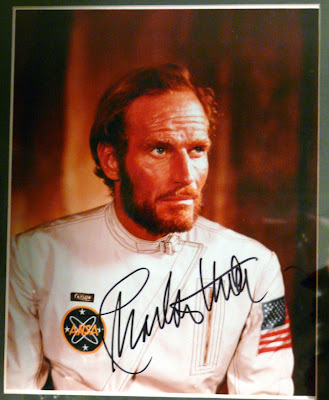 I cannot remember the date but Charlton Heston was in london at a premiere of his film Anthony & Cleopatra,i was sat behind him and i asked him for his autograph on a programme of the film,he obliged me with my request i and still have it here at my home. Yes, it does not appear to be secretarial. Thanks so much for your blog. I just bought a copy of "In the Arena" on Amazon for $13.99 from a bookseller in Alabama. I really wasn't concerned about the autograph; I just wanted to read the book. 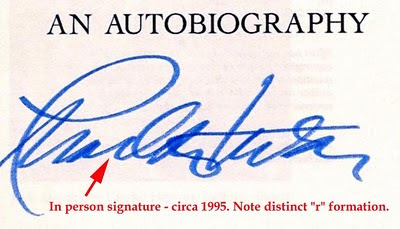 But your blog helps me to know that the autograph is genuine, as it has many features of the authentic signature. 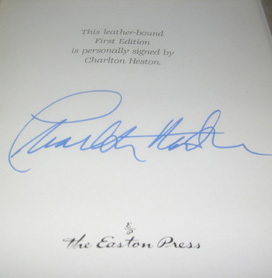 This is a real long-shot, but I found a copy of Charlton Heston's Hollywood inscribed, "John, Quite a business we're in. Yours, Charly." 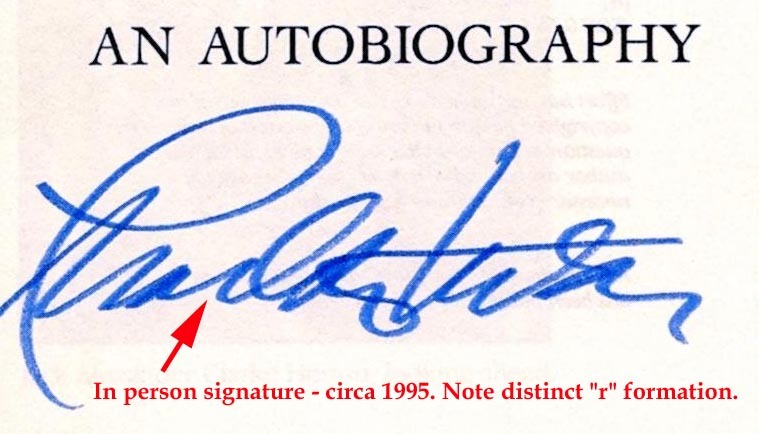 The signature looks nothing like the authentic or secretarial versions, but perhaps he reserved his practiced style of writing for formal signatures (I admit I'm reaching). Have you ever heard of him going by Charly among close acquaintances? I believe he went as "Chuck" to his friends. I have a book signed as "Chuck." If you can post a link to an image, that would be more telling. Depending on the pose and quality of the signature and if it is personalized, it could range from $20 to $60 in my opinion. 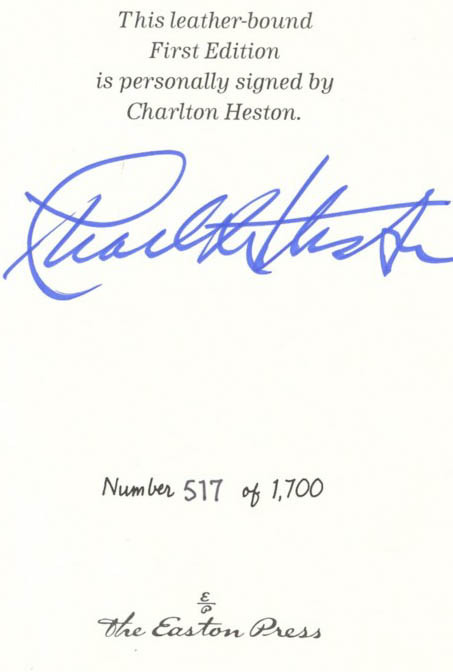 Hi, I wrote to Mr Heston in 1998 and received 2 items back. Looking at your site i think they are sec's. Could you just confirm please. Thanks. Sue: Regrettably those are both secretarial in my opinion.